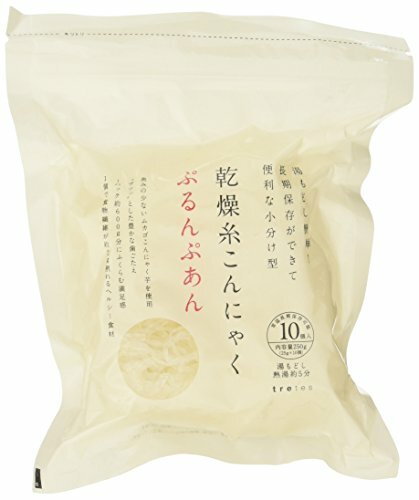 Drying thread konjac (25g X 10 pieces) is X6 bags set. The propagule konjac potato is said to be illusion of konjac potato used as a raw material, it is good is popular unique texture and taste stains that do not taste in other konjac. Because it is processed in a pesticide-free, additive-free, safe and secure! Dietary fiber, about 1.5 times that of the general water containing konjac! Pesticide-free, additive-free is a dietary fiber-rich healthy food. Because it is aliquots 25g it is usability often convenient. (I will return and about 60g.) Taste can be cooked in a short period of time since the easy penetration, because not smell konjac salad and marinated, also for dessert is OK! Convenience attractive available in the back just a few minutes of hot water. Of course, diet, is an article of also recommended to health management. This item was introduced also published in the newspapers, TV. Purunpuan (dry yarn konjac) is supporting employment in developing countries, the independence of people with disabilities. The Purunpuan (perempuan) means "woman" in Indonesian. Buying 6 bags set. Konjac not smell! So, I sell. If you have any questions about this product by Tretes, contact us by completing and submitting the form below. If you are looking for a specif part number, please include it with your message.